Thinking of trying an exciting new vaping e-liquid this year? You’re in luck, with Naked Tiger standing out as an exciting brand worth trialing. With an edgy look which screams class and style, this contemporary offering is definitely worth a sample. 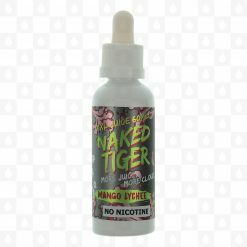 With 5 unique flavours to choose from, you’ll find something you absolutely love with Naked Tiger. Choose from Apple Orange, Lemon Lime, Grape Apple, Mango Lychee and Honeydew Bubblegum.